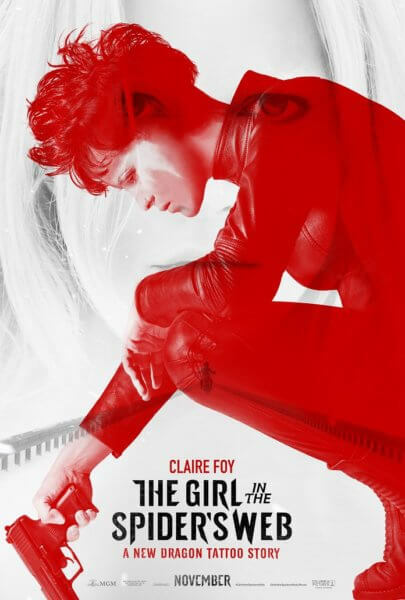 The Girl in the Spider’s Web is a movie that fails to follow the books, and fails to create a good story on its own. It’s a sad attempt to cash in on a successful franchise and an example of a movie script that should never have been green lit. Sometimes you have to wonder how these things even happen. Stieg Larsson did a terrible job in my opinion. But that’s not to say a good story couldn’t be pulled out of it if you rewrote it. There was a good core story there and some interesting characters and elements. The parts that were boring was the dialog and the exploration of technology. There was no reason to do the movie and go completely off the rails from the book, other than to piss off the fan base. So you wind up with a new cast trying to play these beloved characters, but with a crummy script and story. It’s a formula for a disaster. The one thing they do right, however, is that it’s a good looking film and the added action scenes, none of which are in the book, worked well. The acting is good, but it’s not enough to overcome the writing. This is a franchise where it’s not about the action, but intelligent characters and dialog. This was a story where Lisbeth was up against her sister, a skilled manipulator who amassed a group of Russian hackers and mercs who called themselves the Spider Society and went by Marvel comic book names like Thanos. The lead antagonist, the Russian with mask who tries to kill Frans Balder’s kid, he’s a complicated character who has his own child and screws up because he can’t kill a kid. He’s superstitious and quirky, but also very deadly. And Lisbeth’s sister, she’s a person who turned her back on her own mother who was systematically beaten and raped by her father. Lisbeth hates her sister because she saw their mother as weak, and chose the strength of their father to emulate. And the driving core of the story was a scientist who figures out how to break the encryption that all of the world’s security—be it defense departments or credit card companies—depends on. On top of all that, his autistic son is the key to solving his encrypted hard drive that holds all his secrets. Those story elements are all great things to build a story out of, but for some reason, they didn’t use any of them in the film. The Spider Society is simply a bunch of Russian thugs with spider tattoos that used to work for Lisbeth’s dad. There is no connection to comics and super heroes. Frans Balder’s kid, who is almost completely mute in the book, is a normal kid who just happens to be able to do a trick with letters and numbers that allows them to login to Balder’s program. His program no longer has to do anything with breaking the world’s encryption, but it can access nuclear missiles. The NSA character is completely different than the one in the book, as is the reason for him going to see Lisbeth. The Russian merc isn’t explored at all, and Lisbeth’s sister is a bad guy because she wouldn’t jump out a window when they were little kids and when Lisbeth decided to run away. All of the good things in the book are thrown out and replaced with awful, mediocre Hollywood tropes. The bottom line, if you’re a fan of the books or a fan of the previous film, don’t waste your time or money on the thin hope this movie has something of value. It doesn’t. There’s nothing salvageable here, and nothing worth watching. I give it a half a bikini out of five.